Everybody knows Champagne. But the vast majority of what most people are familiar with is the bubbly brand-driven non-vintage brut which, meticulously assembled in a consistent house style year after year, has set the standard for luxury and celebration for well over a century. There’s nothing wrong with this: many of these wines are perfectly enjoyable and some can be downright exceptional. But there are also some interesting and compelling yet largely overlooked anomalies of Champagne that offer an entirely different perspective on the area and thus a deeper understanding of the wine that is made there. and interesting practices in the cellar, such as a local adaptation of the Solera technique of blending. Autumn in Champagne is a spectacular time to explore the region. The countryside and vineyards are abounding in rich palettes of color and the intoxicating fall fragrance instills a unique sensorial experience. Champagne is like laughter as it fills my senses with joy, especially when the cork pops and the bubbles burst with song! The educational experience created by the Wine Scholar Guild is a first class escapade! The inception of our tour and taste of Champagne, guided by Master of Wine, Essi Avellan, brought us full circle through the entire region with a sprinkling of the styles between Houses, Growers and Coopératives. Our adventure began with an introduction to the infamous Champagne Houses of Ruinart and Roederer. It's been said that Champagne has been the site of more bloody battles and large-scale wars than any other place on earth. From the time of Attila the Hun to the Germans in World War II, countless invaders have tried to conquer this strife-torn land. Yet, somehow it managed to become the birthplace of the world's most beloved wine. On December 7, Don and Petie Kladstrup will show how this sparkling wine, born of bloodshed, became the symbol of glamour, good times and celebration. 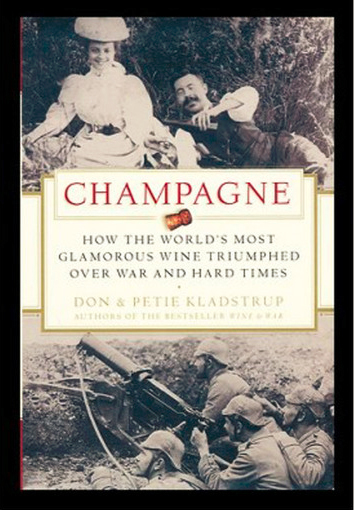 It is a story filled with larger-than-life characters: Dom Perignon, the father of champagne, who, contrary to popular belief, worked his entire life to keep bubbles out of champagne; the Sun King, Louis XIV, who rarely drank anything else; and Napoleon, who, in trying to conquer the world, introduced it to champagne. Petie, an Overseas Press Club winner, was a newspaper journalist and more recently protocol officer for the U.S. ambassador to UNESCO. The Kladstrups divide their time between Paris and Normandy. Learn more about Champagne with the Champagne Master Level Program and embark on a Champagne Wine immersion trip. 2017 Drink/Cellar Champagne’s 2017 season was a chaotic series of extreme events: the perfect illustration of climate scientists’ global warming predictions. A cold winter was followed by a very warm early spring, leading to dangerously early budburst. Severe frosts in the third week of April then eliminated between 20% and 70% of the potential crop, depending on sub-region (the Côte des Bars was worst affected). After that, the weather was exceptionally hot and sunny up to the end of July, breaking many of the region’s heat records. Storms and hail then caused further losses at the beginning of August, and harvest eventually got underway in late August, though the official date was September 4th (which many, with hindsight, considered too late). It was interrupted by heavy rain, and botrytis outbreaks meant that the grapes had to be carefully sorted. The quality of some Chardonnays was fair to good, but 2017 produced poor quality Pinot Noir and Pinot Meunier, and the paucity of grapes means that Champagne houses risk running down their reserves at a time of record sales. 2016 Drink/Cellar A difficult year for Champagne got underway with a mild winter followed by a cool early spring. Snow, then frost struck the region on April 27th-28th, followed by two very wet months which caused unprecendented mildew-related losses. Late July and August, by contrast, were hot enough to cause some problems of sun-burn, with very uneven Chardonnay results in particular. Overall quantities are down by around 33 per cent, and quality is variable, too, with some softness evident in the balance of Chardonnay-dominated wines. 2015 Drink/Cellar After a cold, wet winter and very mixed weather in April, it became sunny, warm and dry in May and stayed that way through a largely hot July and mid-August. The end of August was cooler and wetter, but skies cleared in September and most of the harvest was picked in perfect conditions in the first part of the month. A little rain fell during the picking of the last parcels. Despite relatively low acid levels (2015 is the lowest acid year since 2003), most feel that the wines of this preponderantly warm, dry year are finely balanced, structured, fresh, concentrated and meant for long ageing. A vintage year for all -- with some growers claiming that 2015 is the best vintage since 1947. 2014 Drink/Cellar Spring was mild and warm, leading to a generous fruit set (after two short vintages in 2012 and 2013). July, by contrast, was cool and wet and this indifferent weather lingered into August finally clearing by the end of the month for a fine, harvest-saving September. There was an ample crop of irregular wines with very good results for Chardonnay and Montagne de Reims Pinot, but sometimes dilute results in the Marne Valley (which had twice its normal growing-season rainfall). 2013 Drink/Cellar A long winter and cool spring meant that the Chardonnay didn’t flower until mid-June and the two Pinots in mid-July: a very late date, and potentially disastrous. There was hail damage in the Marne at the end of July. Overall, though, July and August were record-breakingly hot and sunny, saving the vintage and meaning that the early September rain was welcome. Good conditions then resumed for an October harvest of tense and acidic but good quality fruit, ideal for ageing. A vintage year for most. 2012 Drink/Cellar Widespread frosts in April touched 131 villages (of 319). Very cold, sunless weather for flowering. Long rainless period from mid-July to September. Total yield: 9,208 kg/ha, lowest volume since 2003, ~40% below 10-year average. Highest average sugars across all varieties. Overall maturity equals 2009. A vintage year is anticipated. 2011 Drink Hot, dry spring. Exceptionally large harvest, 13,261 kg/ha. Average sugar ripeness & acidities. 2010 Drink/Cellar Rains mid-August provoked widespread rot reducing crop substantially. High sugars for Chardonnay/Pinot Noir, highest acidities for Pinots in decade of 2000s. Limited vintage declarations. 2009 Drink Warmest conditions since 2003, optimal maturity, healthy fruit. Balanced wines with average sugars, lower acidities. High overall maturity. Vintage year for some, principally récoltants-manipulants (individual growers). In ’09, new EU rules reduced dosage for Brut to 12 g/l. 2008 Drink/Cellar Moderate yields; wines of moderate concentration & acidity. Overall sugar-acid ratio dropped to level of 1990s from higher maturities of 2000s. Declared vintage by many récoltants-manipulants (individual growers). 2007 Drink Chardonnay performed best. Summer hail. Lowest fruit maturity of the 2000s. Non-vintage year for many négociants-manipulants (houses), typically declared by récoltants-manipulants (individual growers). 2006 Drink Cold winter, hot & dry summer. Abundant year, heterogeneous ripening. Above average pH & sugars, average acidity. High overall maturity, in line with ’09 & ’12. Numerous vintage declarations by many producers. 2005 Drink More difficult season than many French regions in ’05. Successful Chardonnay, weak Pinot Meunier. Good sugar levels, below average acidities. Vintage declaration by many négociants-manipulants (houses) & récoltants-manipulants (growers). 2004 Drink Harvest delivered record volume & sound quality. Chardonnay, Meunier were best. Balanced, well-structured Champagnes some compare to ’98. 2003 Drink/Past peak Atypically hot summer. Earliest harvest since 1822, abnormally low yields of 8,254 kg/ha. Richness & elevated alcohol levels. Numerous vintage declarations. Some examples are missing sufficient backbone. 2002 Drink/Cellar Both Chardonnay & Pinot Noir ripened well. Balanced Champagnes, a declared vintage by producers of all types. Superb prestige Champagnes, many will benefit from further cellaring. 2001 Past peak Cold, wet September. Lacked maturity: low sugars & elevated acidity. Not a vintage year except for some récoltants-manipulants (individual growers). 2000 Drink Difficult summer marked by rain, widespread hail. Favorable September weather for harvest. Widely declared “millennium” vintage… some fine examples, 0thers are soft, lack intensity & should be drunk (now).